Our next Anime Nite @ The Geek Easy will be Friday, September 14th at A Comic Shop! 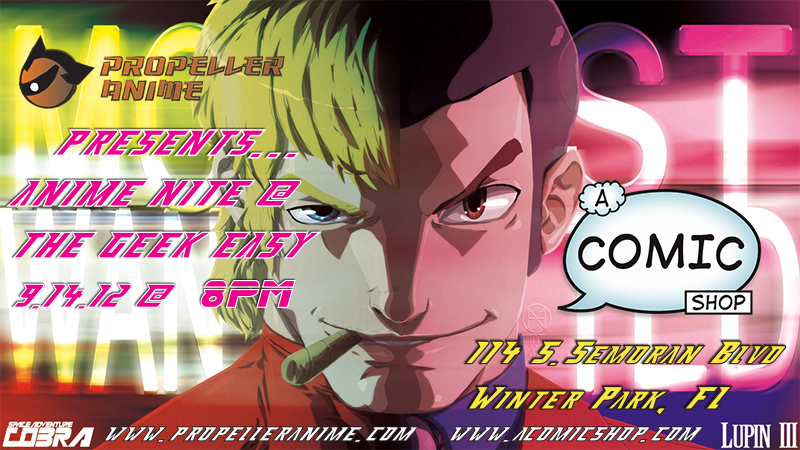 Our theme will be "Most Wanted," showcasing the lovable scoundrels of the anime world! The event will start at 8PM and A Comic Shop is located at 114. South Semoran Blvd. Winter Park, FL 32792. Our first feature is Space Adventure Cobra. Cobra's a space pirate with the highest bounty in the galaxy and is armed with the legendary psychogun that he fires with the power of his mind! (Basically Mega Man's armcannon before Mega Man even existed.) He's also the HAN SOLO OF ANIME! After laying low for a couple years, Cobra comes out of retirement to team up with Jane, a beautiful bounty hunter, to rescue her sisters from the sinister Pirate Guild! However, the task is not simple and the fate of the galaxy will be in peril! The other feature for the night will be Lupin the 3rd Episode 0: The First Contact. This is an origin story that chronicles how the gang and Zenigata first met when Arsene Lupin III is after mafia boss Galvez's single most precious treasure: a treasure within a treasure! Lupin also has a rival thief with a girlfriend he had better watch out for! Inspector Zenigata of the ICPO travels across the world just to arrest that particular femme fatale. Jigen is Galvez's hired gun sent to kill Lupin. The First Contact is regarded as one the best Lupin the 3rd specials. Along with Space Adventure Cobra, "Most Wanted" will make for a fun Anime Nite! There may be a surprise left so stay tuned for updates! We would like to thank distributor Discotek Media for letting us show these features, and *theCHAMBA for creating the original art we used for our event graphic.